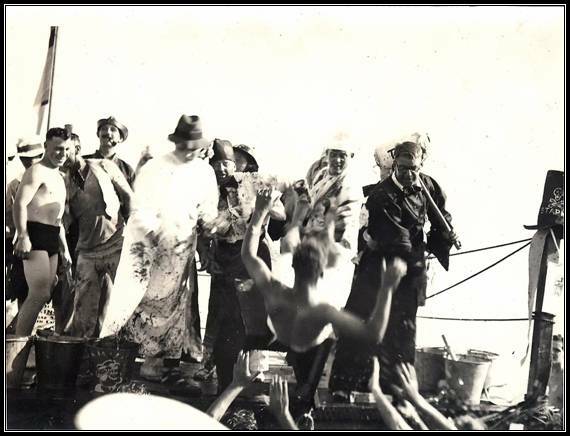 To this very day many ships and their companies perform certain rites and celebrations when crossing the equator. 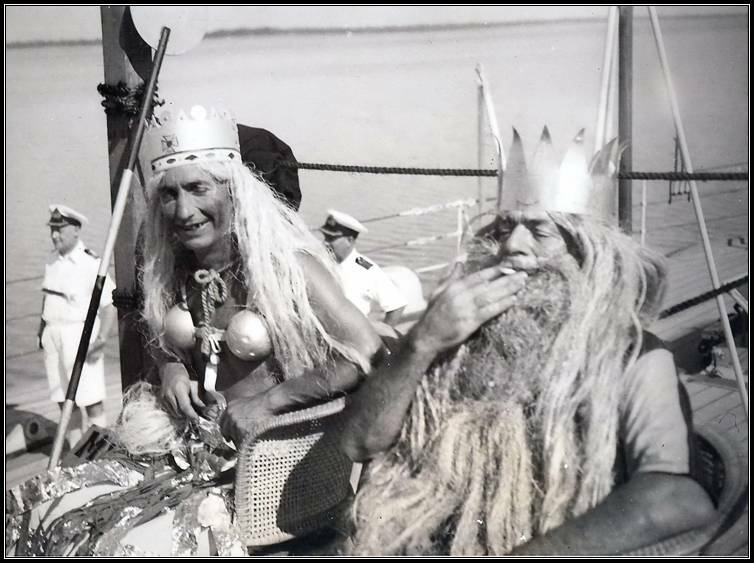 These ceremonies usually involve King Neptune (after the Roman God of the Sea) and his court and retinue. 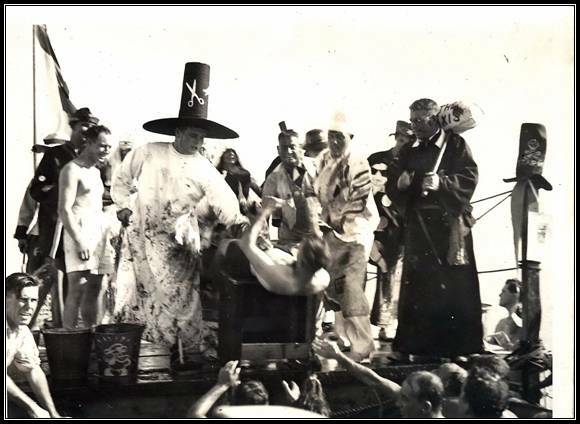 The rituals are often somewhat bizarre and very “tongue in cheek”. 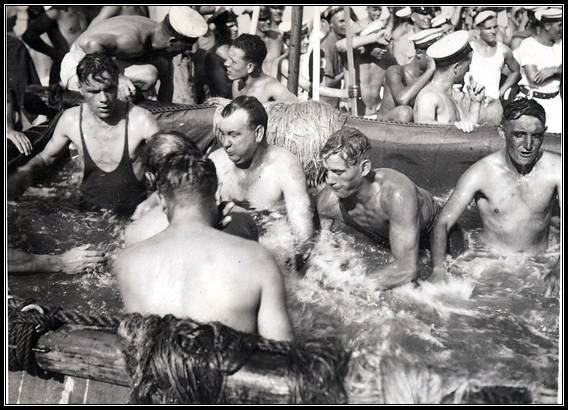 From the following one surmises that the crew of HMS Dauntless clearly enjoyed these exercises. 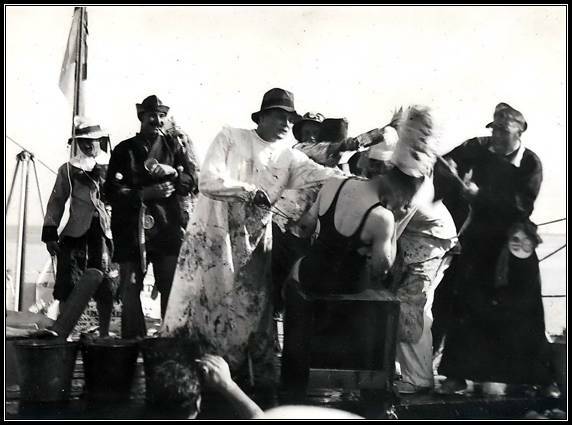 “Crossing of the line” Ceremony which took place on H.M.S Dauntless on 21st October 1932 during her South America and the Straits tour of duty 1932 – 1935. This is a rare certificate issued to Able Seaman Edward G. Christopher, Service Number JX324358, whose details are listed below for participation in the Naval tradition of Crossing the line (i.e. One hemisphere to the other.) 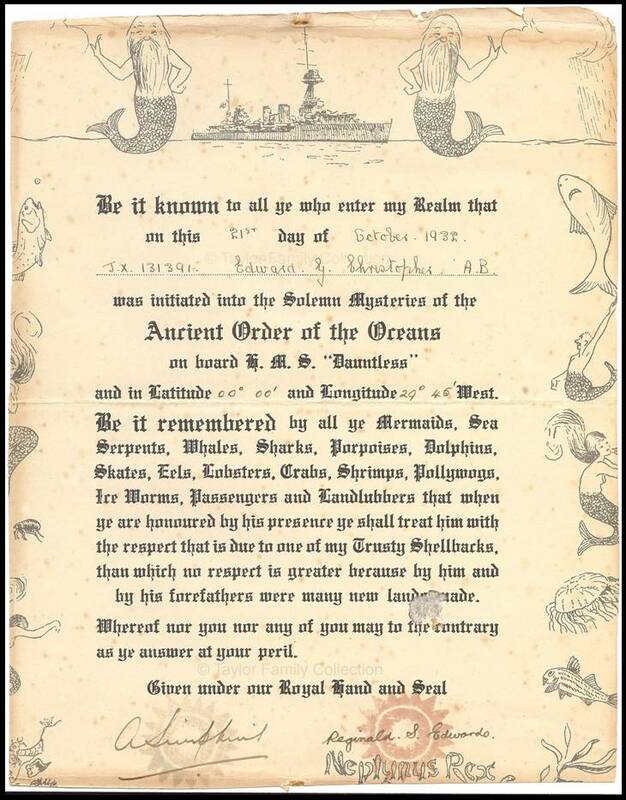 This not only includes his certificate (wording below) but also the original wording of this particular ceremony which took place on board H.M.S DAUNTLESS at 8.40pm on 21st October 1932. The reason I am able to quote the exact time is that the whole ceremony wording which is included as part of this lot is transcripted in the book “H.M.S DAUNTLESS”. 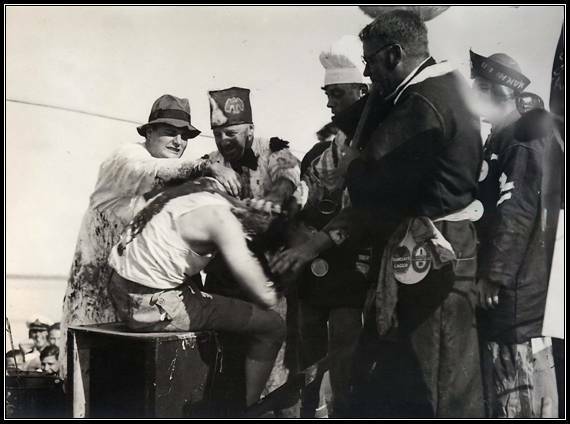 South America and the straits, 1932-35, pages 3-11 (The book was included in another auction as are the photographs of the ceremony). The book and the ceremony notes included here list the names of the initiated\novices. 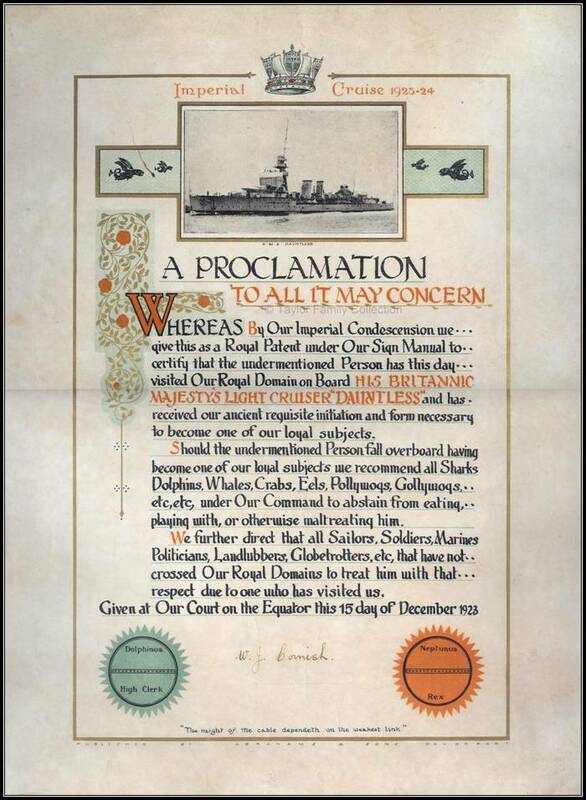 Although the certificate is genuine as to the date and Christopher’s service records show he was on Dauntless during this time his name does not appear in the notes. 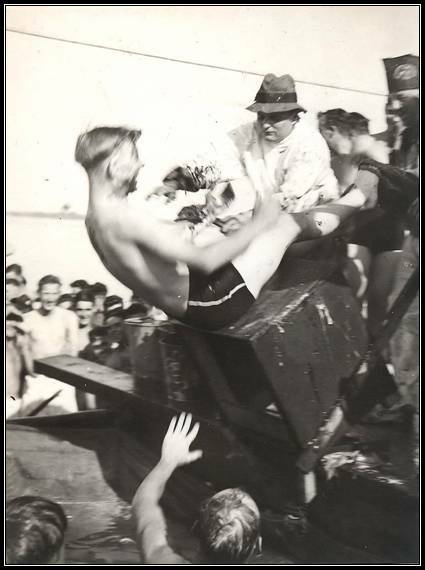 The following seven photographs - all from Able Seaman Christopher’s collection - graphically illustrate the sort of nonsense we humans get up to.